In Hispanic countries, Montero is also the name for Mitsubishi Pajero or Mitsubishi Challenger. 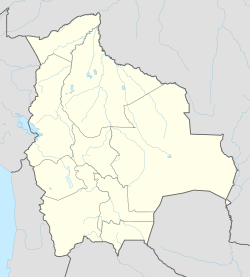 Montero is a city & a municipality in Santa Cruz, Bolivia, about 50 km north of Santa Cruz de la Sierra. Population 109,503 (2012). Montero has experienced growth in recent decades, becoming an important city in this region. Montero has an elevation of 300 meters above sea level and an average temperature of 23 °C. The city is predominantly agricultural, producing soybeans, cotton, corn and rice. This Santa Cruz Department location article is a stub. You can help Wikipedia by expanding it. This page was last edited on 9 February 2019, at 20:49 (UTC).